Maybe you saw the independent foodie movie Chef, a comedy about a chef who leaves his upscale restaurant job to fix up a food truck and sell Cubanos, mouth-watering ham, pork, and cheese Cuban sandwiches. The chef follows his bliss and a growing trend. 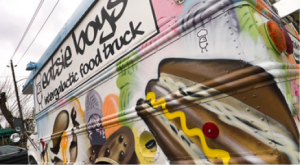 Food trucks are a hit these days, offering quality quick fare, including gourmet offerings, at a great price. On top of that, customers can feel good that they’re supporting the enterprising smaller entrepreneur. In Houston and surrounding areas, there’s no shortage of delicious cuisine circulating throughout the city. Tacos, burgers, kimchi, Korean-Mexican fusion dishes, gourmet hot dogs, Asian stir-fry, crepes, Mexican sweet breads, chicken pot pie, and pizza are some of the possibilities. 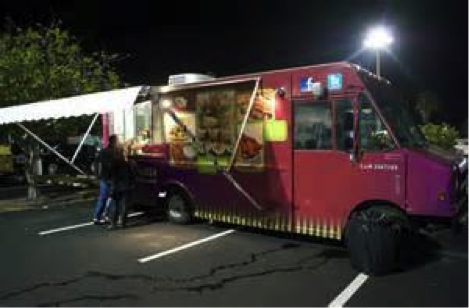 Check out the daily variety of food trucks that visit Houston Food Park, 1504 St. Emanuel St. (77003), https://twitter.com/Houfoodpark or https://www.facebook.com/HoustonFoodPark. Another local option is Midtown Mobile Cuisine, http://midtownmobilecuisine.com , at 4002 Almeda. Bernie’s Burger Bus. A popular Houston institution, Bernie’s Burger Bus includes a fleet of three converted school buses that move to different sites in the city. In 2014, Bernie’s also opened a restaurant in Bellaire. Bernie’s is renowned for its homemade fries and condiments, including the ketchup (so popular that it’s sold in retail outlets), mayonnaise, chipotle aioli, and pickles. With names such as “The Principal,” “Study Hall,” and “Homeroom,” burgers include black angus beef, fresh-baked buns, and toppings such as jalapenos, fried egg, applewood smoked bacon, and braised pork belly. To find where the Bernie’s buses are each day and when, check Twitter or Facebook or go to their website: www.berniesburgerbus.com. Quite a Stir Curbside Stir-Fry. Chef-madeAsian-fusion stir fry with a tip of the hat to Texas. Fresh ingredients go into their tantalizing selections made from scratch daily. Try their popular egg rolls and shrimp skewers. 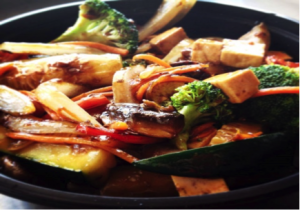 The menu also includes scrumptious vegan and vegetarian choices. To find the schedule for Quite a Stir, go to https://www.facebook.com/curbsidestirfry or email them at Quiteastir@att.net. The Waffle Bus. Enjoy a waffle-inspired menu thatincludes buttermilk fried chicken, a burger, or smoked salmonon a waffle sandwich. You might want to try the buttermilk fried chicken salad with romaine lettuce, organic baby spinach, tomatoes, and garlic-butter waffle croutons. The bus also serves sweet waffle sandwiches, including a chocolate-covered strawberry delight and a strawberry Irish cream Crème brûlée. Find the Waffle Bus locations by going to www.thewafflebus.com or email them at Info@TheWaffleBus.com. La Panza Feliz. Tasty tacos, quesadillas, fajitas, burritos, tortas and other Mexican cuisine at great prices. Find them at: 5231 Aldine Mail Rd., Houston, TX 77039, 281-219-3073. Coreanos. The word Coreanos translates as “Koreans” in Spanish, and the selections are described as “Mexican cuisine with Korean in-between.” The menu includes popular Korean barbecue tacos and burritos, as well as specialty fries. Kim cheese fries, one of the three French- fry items, are made with spicy twice-cooked pork belly, carmelized kimchi, cheese, and “el scorcho sauce.” Tasty! Smithsonian Magazine named Coreanos No. 8 in a list of best food trucks in the nation for 2012 and crowned it the No. 1 food truck in Texas. Late night food! Find its schedule by going to http://houston.coreanostx.com and follow on Facebook and Twitter. Eatsie Boys. Besides an”Intergalactic Food Truck,” Eatsie Boys also serves from a brick-and-mortar site. Food truck menu items include seasonal chef-inspired salads and sandwiches. Lots of good eats to go from Eatsie Boys. Other sandwiches are made from slow-cooked pork belly, marinated chicken, or tofu. The truck also serves falafels, not to mention mint-parsley-dusted beet fries and an assortment of ice cream popsicles. Track Eatsie Boys by going to eatsieboys.com, emailing them at info@eatsieboys.com, and following them on Facebook and Twitter. Served from a truck named Sasha, dishes include their specialty, pho, a savory beef noodle soup that’s comfort in a cup. Sample the tasty Vietnamese eggrolls–the pork and shrimp and/or the vegetarian. And don’t pass up the popular Vandalizer banh mi: mouth-watering filet mignon chunks on a freshly baked baguette with homemade mayo, pickled red onions, crisp watercress, and grilled jalapenos drizzled with salt-and-pepper lemon juice. Finish off with some locally churned ice cream or the deep-fried sesame balls filled with sweet red beans. For the Phamily Bites schedule, go to www.phamilybites.com and follow on Twitter and Facebook. Phone: 832-598-8PHO. Pi Pizza Truck. Pi Pizza serves creatively conceived pizzas, unique toppings on crusts with dough made from scratch. Here are some examples: “Strawberry Wine” pizza made with fresh strawberries, goat cheese, candied ginger, and mozzarella. The ingredients for the “Turkish Deez Nuts” pizza include pancetta, medjool dates, fresh mint, and hazelnut-whipped goat cheese toppings. Simply delicious. Pi Pizza serves gourmet delights. 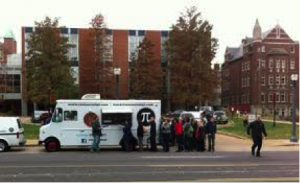 Pi Pizza is named in Houstonia Magazine‘s 2014 article “The 10 Best Food Trucks Right Now,” and in 2013, the truck was listed in “The Rest of the Best: Houston’s Top 10 ‘Fancy’ Food Trucks” by the Houston Press blog. To learn more about the menu and schedule, go to www.pipizzatruck.com. Email: pi.pizzatruck@gmail.com. Phone: 713-478-0374. Chocolate Wasted Ice Cream. This isn’t your typical neighborhood ice cream truck. Chocolate Wasted carries pre-packaged ice cream, popsicles and other decadent frozen goodies from local sources. Selections range from coconut, pineapple, mango and watermelon ice creams to Blue Bell ice cream cups available with St. Arnold root beer. The line up changes regularly. Nominate Your Favorite Houston Food Truck! Houston Food Park is about to open a new Downtown location too!